“If I’d fallen, I’d surely agree that some wings would’ve come in handy. If wishes were horses, beggars would ride, and if caterpillars could sprout wings by holding their breath and pushing with all their might, I’d have wings that would make most eagles green with envy. “But I’m still just a green caterpillar, Mrs. Ladybug, and trying harder is not working! So, if you please, madam, I’d be obliged if you would take your stories of caterpillars sprouting wings to some other tree where you may find a more gullible class of caterpillar. “I’m sure you mean well, and I’ve no doubt that you honestly believe those stories of winged worms, but I am not too good to be a caterpillar. A caterpillar I was born, and a caterpillar I shall gladly remain. With that, the caterpillar turned on his many heels and wormed his way over to the next leaf. He felt oddly tired and soon found himself snuggling up to a nearby branch. Hmm, maybe he’d just wrap himself up for a while and settle in for a long nap. Caterpillars and wings! Of all the silly stories . 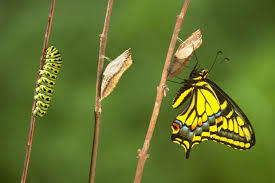 . .
And of all the silly caterpillars, that one is in for a serious surprise and a world-class transformation. But trying harder won’t get it done. Only nature’s Creator will get it done, at just the right time and in just the right way. Most of what passes for religion in this world is, when push comes to shove, all about humanity’s ability to do a better job pushing and shoving. It boils down to self-help horse hockey that puts far too much emphasis on our ability and almost completely disregards God’s power. Christians, of all people, should know better, but we fall easy prey to “religion” that gives lip service to God but is really all about our trying harder to “be good,” which we could do just as well if the cross had never happened. Self-help religion requires no Savior, no cross. God has something far different and far better in mind. It’s not about human power. It’s not about our ability to keep the rules. It’s about God’s Spirit transforming us from within: “If anyone is in Christ, he is a new creation!” (2 Corinthians 5:17-18). And the apostle says specifically, “All this is from God” lest we think it comes from our own power to change ourselves and impress even God with how good we are. If your faith is all about how really motivated worms can work harder and sprout wings, you need to find a different tree. One that’s shaped like a cross. This entry was posted on Monday, March 4th, 2019 at 1:58 pm	and tagged with caterpillars, Christ, Faith, grace, grace by faith, justification, metamorphosis, righteousness, self-improvement, self-righteousness and posted in Uncategorized. You can follow any responses to this entry through the RSS 2.0 feed.